Biking on the Big Island is rarely considered by tourists and commonly thought of as “something only those crazy triathlon types would do”. 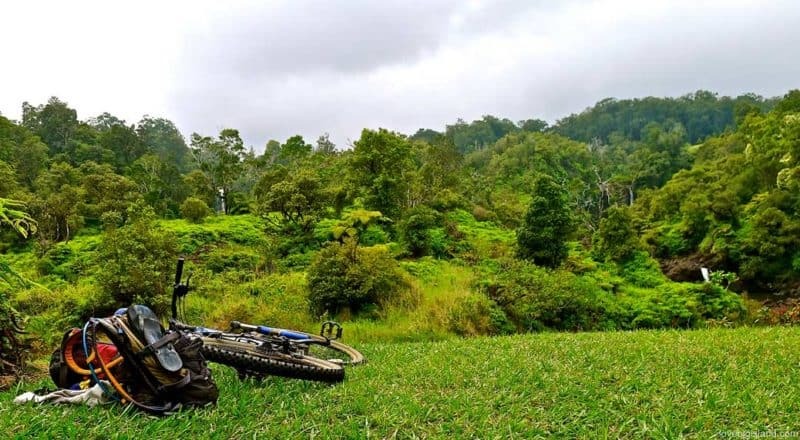 However, it can be a very rewarding and fun experience to rent a bike during the day and cruise around town and along the shore, or to head into the rainforest to see the volcano on your mountain bike. Biking is, in our opinion, a far better option than the car if you want to take in the surroundings. You can stop anytime and everywhere, ride at your own pace and take in the sounds, smells, and colors from up and close. We especially like biking in the Hawaii Volcanoes National Park or along the winding coastal roads. It is possible to rent a bike in most places on the Big Island. We list below our go-to places in Hilo, Kona, Waikoloa, and Waimea. Expect to pay between $25 (for the most basic bikes, not available in every shop) to $100+ (all the works, carbon fiber frame and wheels, etc.) for the first 24 hours, with a steep discount for following days. If you are looking for more than a leisure bike ride, have a look at the Big Island Bike Guide from PATH for bike trails around the Island. The best (and most spectacular) place to ride your bike on the Big Island is, without any doubt, the Hawaii Volcanoes National Park. There are trails for every skill set and age, and the biggest challenge will be to get your bike up to the park. The national park gives information on “how to bike the volcanoes“, listing all bike trails inside the park, as well as safety information and some handy pointers. If you like a challenging ride, try one of our favorite scenic drives, the Mauna Loa summit road! It is not possible to rent a bike in the park or in the nearby Volcano Village. To have a bike in the park you either have to bring up your bike with your car or join a tour. If you like biking but don’t like planning, you can also choose for an arranged bicycle tour. The people organizing these tours take all the planning out of your hands and make sure you have a fitting bicycle, protective gear, transport to and from the tour location and, if needed, food, drinks and accommodation underway. These tours last between 3 and 7 hours, and cost at around $100 per person (depending on a lot of things). If you’d like to explore the Hawaii Volcanoes National Park by bike we can heartily recommend the tours organized in and around the Hawaii Volcanoes National Park by bikevolcano.com. If you are staying in Kona, the people from velissimo // cyclekona.com can be of help to you. Velissimo is the longest operating local cycling tour business on the Big Island of Hawaii, and they are organizing a wide range of tours. These range from days trip [click here to see the bikekona daily tours] to e.g. Pololu valley [read more about Pololu valley] or a downhill tour from atop the oldest volcano on the Big Island to the ocean, to “around the island” vacation tours taking up more than a week of your time [click here to see all the multiple day tours]. 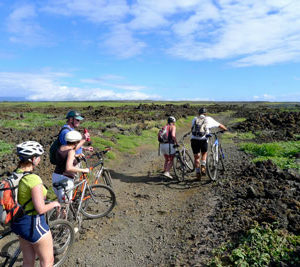 Big Island Bike Tours (located in Waimea) also organizes bike tours all over the island. 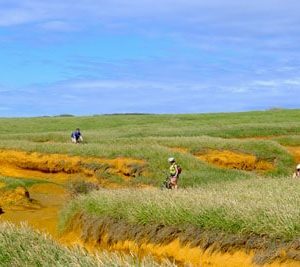 Big Island bike tours [website] is a locally owned and operated eco-tour company located at the historic Anna Ranch in Waimea. They offer both mountain and road bike tours lead by former professional cyclist Alex Candelario. Please, take good care of your own safety! People on the Big Island drive their cars with more aloha than on the mainland, but regardless people are not as used to bikes on the road as, for example, in Europe. You should  wear head protection (which is included at most bike rental shops) and  stay away from roads that are frequently used by cars, or at least ride your bike on the soft shoulder of the road if there is no other option.